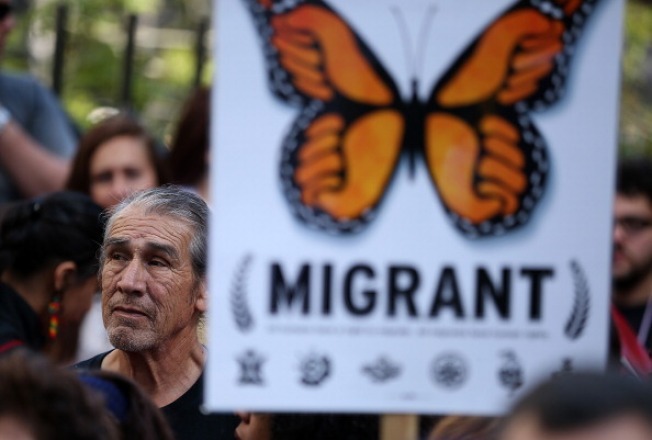 FILE ART - A protestor looks on during an immigration reform demonstration on April 10, 2013 in San Francisco, California. Alameda County leaders are adding to the pressure on Sheriff Greg Ahern to stop detaining immigrants under a federal program that has led to the deportation of nearly 2,000 county residents since 2008. The Oakland Tribune says Supervisor Richard Valle will introduce a resolution Tuesday urging the sheriff to pull out of Secure Communities, a voluntary program in which local authorities forward fingerprints of anyone they arrest to federal officials. The prints are then compared against a database to check criminal histories and immigration status. Valle says the program costs the county money and leads to unequal treatment of residents, Latinos in particular. Ahern argues that he is following federal policies, even as nearby cities and counties, including San Jose and San Francisco, have stopped cooperating with the program.